Homemade pasta is not as difficult as you might think; when you're serving just two people, there's no need to make a large batch of pasta. This homemade pasta recipe is a perfect size, and the smaller the batch, the easier it is to make. 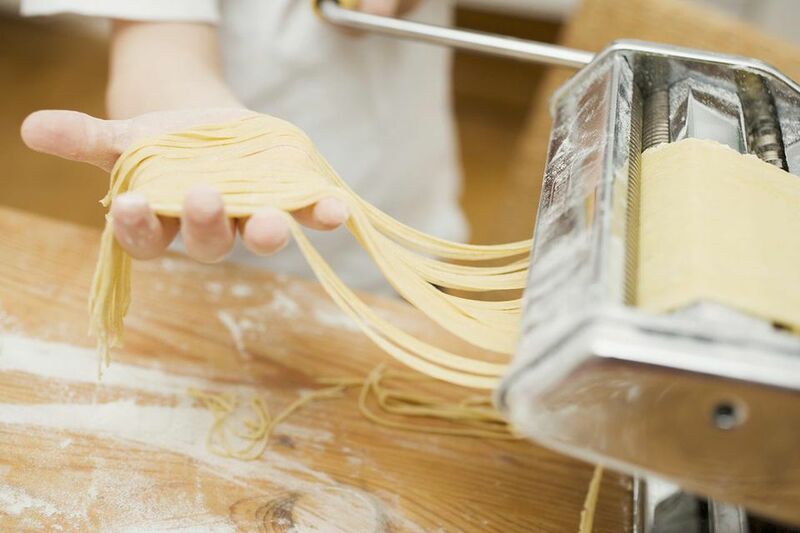 This method of making fresh pasta requires a pasta roller, either hand-cranked or electric. If you have not had much practice using yours, this is an excellent opportunity. While some home cooks can be intimidated by pasta rollers, all it takes is practice and patience. By working with a small batch, you won't be wasting time or dough and after a few rounds, you'll be a pro. You can use this recipe to make any pasta style you like, from spaghetti to linguine and lasagna to ravioli. It's a versatile recipe and a fun project to cook with your partner. If you don't have a food processor, mix the ingredients together with a hand mixer or large spoon until thoroughly incorporated. There are those who claim that the only "authentic" way to mix pasta is to make a well with the flour, add the egg, and mix by hand. This method can be messy and inefficient but feel free to try it. Place 3/4 cup flour, the egg, and oil in the bowl of a small food processor. Pulse until the ingredients are thoroughly mixed. The mixture will look dry like very small pebbles, but it should hold together when pinched between your fingers. If it doesn't, add about 1/2 teaspoon of water and pulse again. Dump the mixture out onto a board and press into a ball. Knead briefly, until the dough holds together and gets slightly smoother. Flatten the ball out into an oval shape and dust both sides lightly with flour. Set your pasta roller on the widest setting (usually setting #1). Feed the oval of dough through the roller. Don't worry if it tears a little, but it shouldn't fall apart. Fold the strip of dough into thirds and press it together. Continue feeding the dough through the roller and folding it into thirds several times, rotating the dough so that the rough edges feed through first. Dust with flour as necessary to keep the dough from sticking. When the dough is very smooth and elastic, change the setting to the second widest setting (usually #2). Feed the dough through twice. At this point, if you like, cut the strip of dough in half and work with one half at a time. Cover the second piece with plastic wrap so it doesn't dry out. Set the roller one setting thinner and feed the dough through. Continue feeding, advancing the roller setting one notch each time, until you're at the next-to-last setting. The dough should be thin but not transparent. Depending on how you like your pasta and what you're using it for, you may want to roll it through on the last setting as well. If the dough is at all sticky at any point, sprinkle it lightly with flour. If you cut the dough in half, repeat these steps with the second half, beginning at setting #2 on your roller. Cut the pasta however you like, or use the sheets in lasagna or for ravioli. At this point, if you're making noodles, spaghetti, linguine or the like, you can either cook the pasta right away or let it sit. If you opt to let it rest, lay the pasta out in a single layer on a lightly floured board or parchment-lined sheet pan until you're ready to cook it. It will dry out slightly, so be careful not to break the noodles. If you're cooking it fresh, it will take about 1 minute to 90 seconds to cook in boiling salted water. If you let it dry slightly, it will take about 2 minutes. If you're using the pasta in ravioli or lasagna, either use it right away or cover it with plastic wrap so that it doesn't dry out.